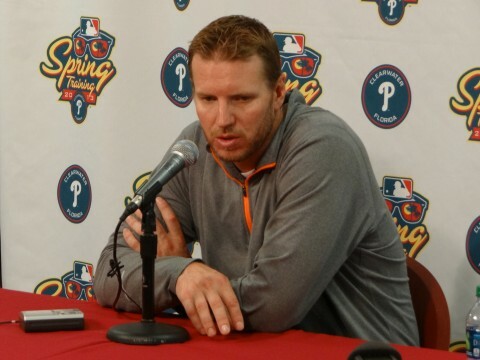 CLEARWATER, FLA.—Philadelphia Phillies right-hander Roy Halladay wants to stay and finish his career as a Phillie. Halladay met with the media Wednesday morning February 13, 2013 as the team’s pitchers and catchers ended their first day of workouts. The 35-year old was Toronto’s first pick in the 1995 draft. Signed through the 2013 season with a vesting for 2014 Halladay has an overall record of 199-100 with a 3.31 era. He also has two CY Young awards, one with Toronto and one with Philadelphia, eight All Star appearances and a post season no hitter to his credit. Halladay was asked about his fishing buddy Chris Carpenter and his problems that might end his career.